FEIFEIER DMX512 36 X 3W CREE LED Moving Head RGB DJ Disco Stage Party Effect Lighting by FEIFEIER at IGWT. Hurry! Limited time offer. Offer valid only while supplies last. 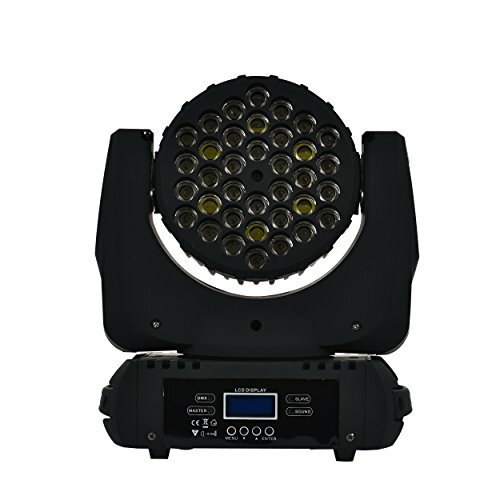 Power input:AC 90V-240V/50-60HZ.Power:140W Light Source:36pcs 3W CREE LED lamps. (R:8:G10:B:10;W8),LED lifespan:about 50000 hours. Light Source:36pcs 3W CREE LED lamps. (R:8:G10:B:10;W8),LED lifespan:about 50000 hours. Effect:storbe,fade,color mixing .Beam angle:8 degree.Rotation angle:Pan 630degree tilt 240degree,self-correcting. Weight:5KG,Size Approx:320 X 230X 350mm.Package Included:1 x light /User Manual. Cooling system: 3 cables temperature control cooling fan. DHL Shipment you can receive it within 3-7 days.